A friendly welcome! We promise not to embarrass you by calling attention to you or asking you to stand-up during the service. You can expect a meaningful worship experience that involves the singing of hymns, saying prayers together, an opportunity to share our joys and concerns, special music from the choir or other musicians, the reading of scripture, and a meaningful message that connects the scripture reading to our lives in relevant and memorable way. There is ample on-street parking on both Monument and Meridian Streets. Handicapped accessible parking is available and if there are any other accessibility issues you have (such as being an expectant mother or other needs) we will make sure you have a good parking spot! Please wear whatever makes you comfortable. There is a wide range of how people dress – from jeans to jackets. So, come as you are! We want you to be yourself, not have to pretend to be someone else. Yes, our church is fully accessible including our sanctuary, fellowship hall, and restrooms. Additionally, our worship space has special accommodations for people using wheelchairs. We have Holy Communion, also known as The Lord’s Supper or the Eucharist, the first Sunday of each month. We also celebrate Communion as the Spirit moves us. The bread we use is gluten free and we will do our best to accommodate other food allergies you may have so that you are able to participate if you choose to do so. We offer a choice of grape juice or wine. You don’t have to be a member of our congregation to participate–everyone is welcome at the table! Just click here to find us! 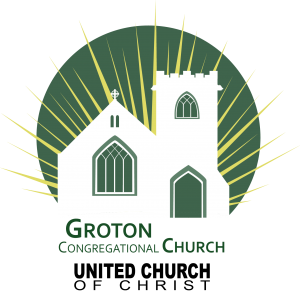 You are welcome here at Groton Congregational Church!